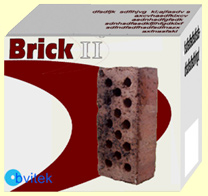 In 2001 Obvitek released The Brick® and took the industry by storm. With sales of over 20 million units world-wide, and boasting the largest installed user base of any product in its class, The Brick ® easily outstripped its nearest rival by a factor of ten. Boasting enhanced high-definition textures and a new, sleeker design, Brick II® will put you at the centre of an entertainment revolution. Faster, sharper and more powerful than its predecessor, Brick II® guarantees a whole new world of experiences, new horizons, new possibilities. Check out these blockbusting new features! Specially developed lithium technology means no more expensive batteries. Brick II® just keeps on working. Gone are those troublesome wires and cables. Obvitek's team of top engineers have rendered Brick II® cordless, for the ultimate in convenience and ease of use. The new, ergonomically enhanced design means you can take Brick II® with you anywhere. Slips easily into into your pocket, bag or hod. Whether you're in the home or at the office, Brick II® is compatible with a range of devices, tools and mortars, meaning that you will never be left out of the loop. Redefining the Medium. Reinventing the Future.